Precocious Player: Essex Teen Is a Classical Music Master | One to Watch | Kids VT - small people, big ideas! While the music of artists like Ariana Grande, Post Malone and Drake might excite the typical teen, Henry Wu is more keen on the works of Frédéric Chopin, Johann Sebastian Bach and Camille Saint-Saëns. The 16-year-old pianist and cellist is involved with a variety of classical music endeavors, including playing in the Essex High School orchestra and the Vermont Youth Orchestra. Henry, a junior at Essex High School, has garnered many musical accolades. 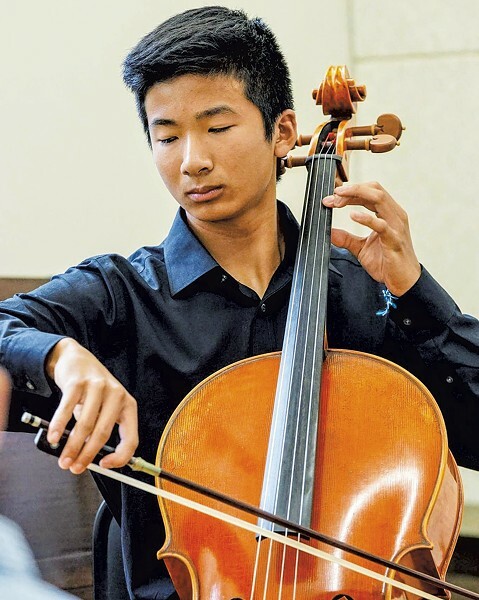 A pianist since age 5 and a cellist since fourth grade, he's the principal cellist in the VYO and a beneficiary of the 2018 Jon Borowicz Memorial Scholarship, which awarded him $500 and allowed him to perform a solo concerto with the Vermont Symphony Orchestra. In the past few years, Henry has gone from simply playing music to taking on important leadership roles. Despite his reserved demeanor, it "comes naturally to me," he says. "I think I have this quiet leadership that works for me." Vermont Youth Orchestra Association music director Benjamin Klemme says Henry is remarkable "not only in his playing, but also in his approach to citizenship" within the orchestra. "He's always volunteering to mentor younger students in the organization," says Klemme. Henry's transition from playing to leading began in the summer of 2016 at an intensive overnight camp sponsored by the Foundation for Chinese Performing Arts at the Walnut Hill School in Natick, Mass. The program, which included the study of orchestral and chamber music, was more rigorous than anything he'd ever done. He returned the following summer for another round. "It confirmed that I want to keep playing music for the rest of my life and help lead and teach others through music," he says. Since this epiphany, Henry discovered the Back to BACH Project, a worldwide, community-based initiative to expose elementary school students to classical music. "They had chapters in big cities around the world, but there wasn't one in Vermont," Henry says. So he started one, and he now serves as the regional director of Burlington's chapter. He and a group of peers from the VYO travel mainly to Chittenden County schools, spreading their love of classical music and explaining the skills required to master their instruments. "I really enjoy performing for young kids because they have an open mind to everything," says Henry. But Henry doesn't just educate kids. He and his twin brother, Nathan, who plays piano and violin, created a concert series called Classical Music Encounters, which they host at local libraries. During a recent performance at the South Burlington Public Library, the brothers presented a series of pieces that comprised a judiciously streamlined history of classical music to a crowd of around 50 onlookers, most of whom appeared old enough to be the boys' grandparents. Starting with the Baroque era, they worked their way through history, playing solo and duo works from the 18th through 20th centuries. Recently, Henry has been branching out to different musical genres. He's a member of SoundCheck, a rock band featuring Vermont high school students from various musical backgrounds and abilities focused on writing and playing songs relating to social justice issues, such as racial equality. "It was a big challenge for me to not play classical music," he says. But SoundCheck artistic director Brian Boyes says Henry thrives in the group. "Henry is that super rare student who brings fierce intelligence [and] powerful talent, yet he also has an immense amount of integrity," Boyes says. "He's a good listener and speaks up when he needs to. Those are rare things to see in anybody, let alone kids." Henry recently took on the role of musical director for the spring production of Shrek the Musical Jr. at Albert D. Lawton Intermediate School in Essex Junction. He's responsible for teaching the score to 40 students playing a wide variety of instruments. Despite his accomplishments, Henry says that, at this point in his life, he doesn't plan to pursue music as a career. So what does he want to do? "So many people have asked me that, and I don't have a great answer," he chuckles. "I'm interested in a lot of things. I really like technology, science and math. I also have a passion for social justice. I don't think there's a career that combines all of [that].